Voidness is that which stands right in the middle between this and that. The void is all-inclusive, having no opposite - there is nothing which it excludes or opposes. It is living void because all forms come out of it and whoever realizes the void is filled with life and power and the love of all human beings. Dōgen Zenji was a Japanese Buddhist priest, writer, poet, philosopher, and founder of the Sōtō school of Zen in Japan. Originally ordained as a monk in the Tendai School in Kyoto, he was ultimately dissatisfied with its teaching and traveled to China to seek out what he believed to be a more authentic Buddhism. He remained there for five years, finally training under Tiantong Rujing, an eminent teacher of the Chinese Caodong lineage. Upon his return to Japan, he began promoting the meditation practice of zazen through literary works such as Fukan zazengi and Bendōwa. ​“Baso, Doitsu (Ma-tsu Tao-i) 709-788. Third most influential master in the history of Zen, after Bodhidharma and Eno. He had at least eighty, and maybe as many as one hundred thirty, enlightened successors, including Hyakujo Ekai and Nansen Fugan. His family name was Ma – Mazu meaning Ancestor Ma or Master Ma.He was born in 709 northwest of Chengdu in Sichuan. During his years as master, Mazu lived in Jiangxi, from which he took the name "Jiangxi Daoyi". Founder of the Rinzai school of Zen. 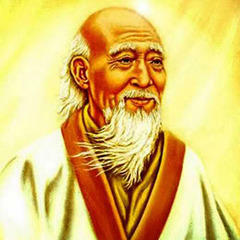 One of the greatest, most influential Chinese masters in Zen history, known for his thunderous shouts and sudden blows. Student of Obaku Kiun. Zhuang Zhou, often known as Zhuangzi ("Master Zhuang"),[a] was an influential Chinese philosopher who lived around the 4th century BC during the Warring States period, a period corresponding to the summit of Chinese philosophy, the Hundred Schools of Thought. He is credited with writing—in part or in whole—a work known by his name, the Zhuangzi, which is one of the foundational texts of Daoism. The traditional founder of Zen in China. Said to have been a monk who traveled from India to China in order to transmit the Authentic Teaching of Buddhism. 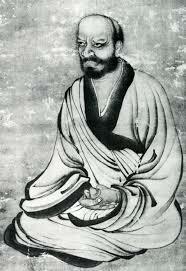 All Zen schools regard him as the First Ancestor of Zen in China. Laozi (also Lao-Tzu /ˈlaʊˈdzʌ/ or Lao-Tze, Chinese: 老子; pinyin: Lǎozǐ, literally "Old Master") was an ancient Chinese philosopher and writer. 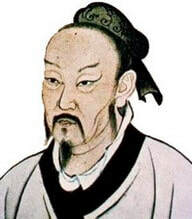 He is known as the reputed author of the Tao Te Ching, the founder of philosophical Taoism, and a deity in religious Taoism and traditional Chinese religions.